Bayern Munich's chief executive has warned of a growing "transfer tsunami" if the Bundesliga cannot compete with the Premier League's spending power. Karl-Heinz Rummenigge wants Germany's TV rights deal to be worth closer to the record £5.136bn the Premier League will receive over the next three years. 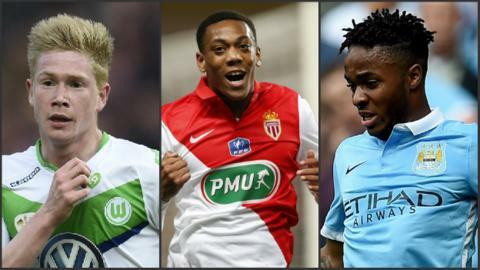 Premier League clubs spent a record £870m on transfers this summer, compared to £290m in the Bundesliga. "This new English contract will dominate the market," Rummenigge said. "We have just seen the tip of the iceberg. The transfer tsunami will increase in strength and height." The current TV rights deal for the Bundesliga is worth 500m euros (£365m) per season, but Rummenigge would like that to at least double. Speaking to Sueddeutsche, he said he worried about German teams' competitiveness in Europe following the departures of some of the Bundesliga's best players to England. World Cup winner Bastian Schweinsteiger moved from Bayern to Manchester United, Wolfsburg forward Kevin de Bruyne joined Manchester City for a German record £55m, while Tottenham signed Bayer Leverkusen forward Son heung-Min for £22m. Germany coach Joachim Low believes the Premier League's spending is detrimental to the England team. "Premier League clubs are now paying three times what they used to," he said. "The English will have to face up to the fact their young players don't get the minutes for their clubs. "That is why the English national team hasn't set the world alight in major championships. "